Do you have a need for a panic alarm? Do you worry something might happen and no one will know? A PERS from Towne Monitoring Service can put your mind at ease. With just a quick press of a button, a user can communicate the emergency to our operators who can take the appropriate action based on the situation. The PERS unit consists of a base and a small pendant that can either be worn around the neck or wrist, or even Velcro-ed to the desk or wall. There is also the option of placing a HELP button somewhere inconspicuous. When an emergency occurs an individual in duress can press one of the buttons and initiate a panic alarm. In this application, the PERS unit is set up to operate silently – there is no annunciation, the operator cannot be heard, the unit makes no noise. However – the operator can listen in to what is happening. If necessary, the operator can dispatch first responders immediately or get in touch with designated individuals to inform them of the situation following a predetermined call escalation. 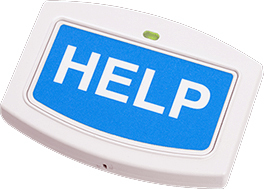 Inexpensive, easy to install, easy to use – this is the perfect way to enable office staff, etc to quickly and quietly signal for help. Units can accommodate up to 16 buttons in any combination. Available in landline or cellular form, the buttons have up to a 600′ range* from the base – this is just under 26 acres of coverage! Contact us today to see how you or your organization can utilize this technology. * Manufacturer states 600′-1000′, depending on conditions, building variables, etc. 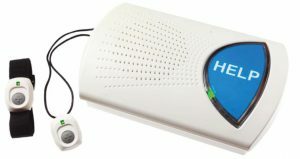 Who Can Benefit From Panic Alarm Emergency Response Devices? Do you have any sort of reception area with public access, or possibly a church staffed lightly during the week, or maybe need it during services? Our PERS device would enable you to quickly and quietly get help. Any setting, where the potential exists to be in an undesirable situation, is capable of using this system. As long as there is power, you are in business. Don’t sit wondering if you’ll be able to get help! Contact us online or call TOWNE today for more information or to discuss how this may work for your needs!